Here are three articles that might be of interest, from separate parts of the country, but interconnected in the growing awareness of how to understand, treat and prevent trauma. The first story looks at how those who were traumatized passed their trauma on to their children. The second story looks at how children who have experienced adversity aren’t really incurable — people just haven’t figured out how to help them. And the third offers some ways to build resilience. Anderson suggested that part of the “pathway to healing” is fostering a more positive environment for children while acknowledging that many adults continue to pass on their own childhood traumas to the next generation. “We need to understand that our parents, while they may have been the vehicles of the perpetration of intergenerational transmission of trauma, were not the reason for it,” Anderson said. An article by Rita Price in the Columbus Dispatch caught my eye, not so much for the headline — Mistreated kids might suffer brain trauma — but for what Dr. Bruce Perry, a child psychiatrist and senior fellow of the ChildTrauma Academy in Houston, was doing for Franklin County Children Services. The story covered his presentation about the neurosequential model of therapeutics (NMT) to 650 child-welfare professionals, including caseworkers, teachers and child-care providers. The basic idea is to provide services based on where a child is developmentally, rather than applying a cookie-cutter approach. Clinicians make a brain map of the child’s neurobiological development to gain a better idea of the status of various brain functions. A 10-year-old child who has been maltreated, Perry said, might have the social skills of a 5-year-old, the speech and language capability of an 8-year-old, and the self-regulation ability of a 2-year-old. Counseling sessions and other cognitive-based therapies are fruitless if the child’s reactions remain primitive, his brain-stem development stunted by stress and fear. Perry is reviewing the cases of five children who aren’t making progress, despite years of effort and millions of dollars invested in their recovery. The story described one case of a nine-year-old girl who’d been exposed to drugs before she was born and who had experienced physical and sexual abuse. 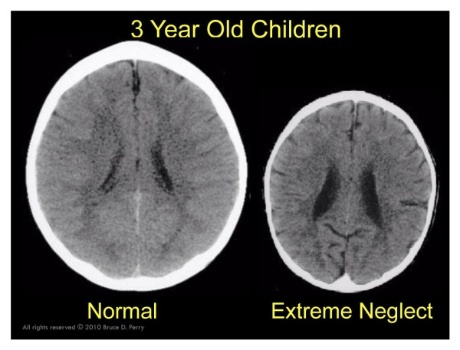 Her brain map showed that she was at a first-grade level academically, but developmentally was at the stage of a two-year-old. The child has been in agency care nearly three years, moving seven times among foster homes, hospitals and treatment centers. “Something that she really likes to do is sing and dance,” (Chip) Spinning (executive director of Franklin County Children Services). But in classes with children her age, she behaves like an angry toddler. “Let her do it alone,” Perry advised. The movement still will help her soothe herself, without the stress of interactions. Forcing explosive children to do the right things before they’re ready is usually disastrous, Perry said, and that might mean temporarily delaying school attendance. – First, every parent must understand the importance of nurturing and attachment. The essential need for every young child to have a consistent and caring relationship with a parent cannot be overstated or underestimated. – Every family must have the opportunity to learn about basic child development. Children do not come with instructions, but they probably should! – Parents need to develop resilience to allow them to parent through the times of stress, and understand that all families have times of stress. This resilience can come from many sources, but it requires that families have the ability and knowledge needed to access outside resources and services in the community when that time comes – without stigma. We all need help sometimes! – Families need social connections. As we think about the little things that each of us can do to prevent child abuse, think about making connections to families in your community that might not have them. Knowing the families in your neighborhood, and being a positive connection and support for those families with young children, has never been more important. – All families need solid support. In our communities and our state, we must support those agencies and providers who work tirelessly to ensure that all families have access to food, clothing, housing, and some form of transportation. More often than not, it is Montana’s children who lack access to these basic supports. – Last, the importance of social and emotional competence in children must be understood and promoted by each of us. The skills that our children need to be successful in their careers are built in day care centers, schools, and on playgrounds and ball fields. There is no way to make up for lost opportunities in childhood.